I am trying to follow the guidance in many articles, one by Fabian williams, on how to make queries from Fiddler or Postman, but I keep getting 401 unauthorized. I have SharePoint on prem 2016, with Feature pack 2. When I try to make the request, I get 401 unauthorized. Dont forget to use BearerToken from authentication request to the Data request. 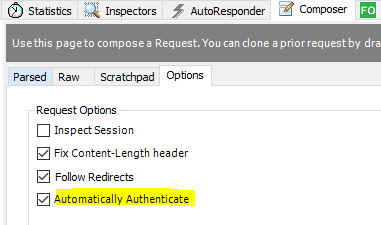 Within Fiddler is an option to "Automatically Authenticate" and it works beautifully. Not the answer you're looking for? Browse other questions tagged sharepoint-server 2016 sharepoint-rest-api authentication postman or ask your own question.